"Don Peebles is an example of what entrepreneurs are all about. In this engaging and witty book, Peebles shares insights from his own success in the world of high– powered real estate. What makes this book different is Peebles doesn′t just focus on the positive, he discusses the failures too something every entrepreneur can expect in his journey to success. This book should be on every aspiring business– person′s bookshelf to be read again and again." "The Peebles Principles provides a fun read and a bird′s–eye view of the ever– changing world of a real estate entrepreneur. It is a good gut check for would–be entrepreneurs to ask if they have what it takes." "Wow! 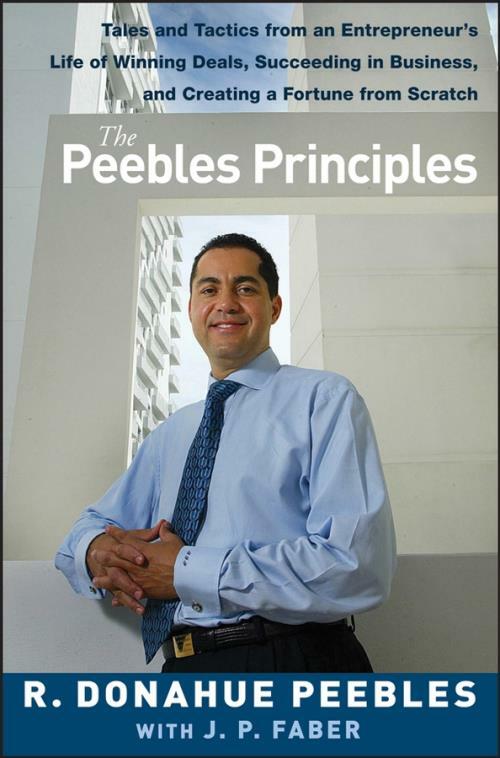 What magnificent inspiration The Peebles Principles is for anyone seeking to be involved in business. The ground rules found in each chapter are absolute gems, and those alone make the book worth buying." Cathy Hughes, Founder and Chairperson, Radio One, Inc.
"This book is a brilliant example of entrepreneurship, creativity, and principles. Peebles walks you through many of his successful deals, from their inception to their completion. Once you start the book you won′t be able to put it down until you′ve finished the last page." Dr. Sanford L. Ziff, Founder and Chairman, Sunglass Hut International Inc.
Chapter 1. From Ground Zero: The First Deal. Chapter 2. The Washington Marriott: No Money Down. Chapter 3. North Capitol and G Street: Carpe Diem. Chapter 4. The Barry Stigma: Time for a Change. Chapter 5. The Royal Palm: Never Say Die. Chapter 6. San Francisco: A Bridge Too Far. Chapter 7. The Bath Club: Give Them What They Want. Chapter 8. Perseverance: The Saga of Royal Palm. Chapter 9. The Lincoln Road: The Power of Allies. Chapter 10. San Francisco Redux: Diamond in the Rough. Appendix. The Importance of Politics. R. Donahue Peebles is Chairman and CEO of The Peebles Corporation. He is a recognized leader in real estate development and entrepreneurship, with a portfolio that includes four–star hotels and luxury residential and commercial properties in Washington, D.C., San Francisco, Las Vegas, and Miami Beach. He is also Chairman of the Greater Miami Convention and Visitors Bureau. He and his projects have been featured inThe New York Times,The Washington Post, Forbes, Inc.,USA Today,The Wall Street Journal,Black Enterprise,Washington Business Journal, andSouth Florida CEO magazine, along with many other prestigious local, national, and international publications. He has been profiled on CNBC and CNN Financial Network, and has been a guest on Bloomberg radio and the Tom Joyner Morning Show. He and his company have received many regional and national awards in recognition of their entrepreneurial success, including the 2004 Black Enterprise Company of the Year award.